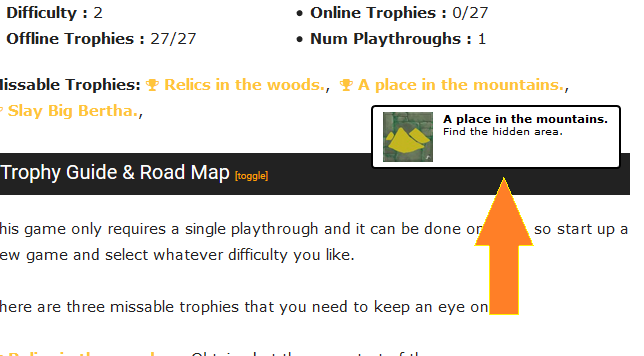 Trophy guides can be submitted for any trophy lists by navigating to the trophy list on the website. Head to the trophy section of the website and search for the trophy list that you want to submit a guide for. Click on the list and it will bring you to the list page where you can see all of the trophies. Click here to search for a trophy list. At the top of the page, there are some controls. One of these controls is “Submit Guide”. This option will ONLY be visible if there is not already a guide there. If the list already has a guide, you can’t submit another. There is only one guide per list. Sometimes there may be more than one list for a game depending on the region e.g. NA and EU have separate lists. This can be a chance for you to submit your guide. Clicking on the Submit Guide button at the top of the trophy list page will bring you to the form where you can submit a guide. Each trophy will have a text box where you can write some information about it. Use the checkboxes below each trophy to add some additional metadata for this trophy. If you have a large collectible guide for a single trophy, rather than post this entire guide for a trophy, submit this as a game guide separately and link to your game guide in the guide for this trophy. This way your collectible guide will get more traffic online along with stopping the trophy guide getting cluttered. If you plan on writing a guide but have not started, you can download a guide template. This is something you can store a text file or word document and you can fill it in as you go through the game. Once the guide is complete, you will be able to quickly copy as paste all of the trophy guide information into the form and submit it. You may notice on other trophy guide pages that there are often colored trophy links that will show the trophy information when you hover over them. 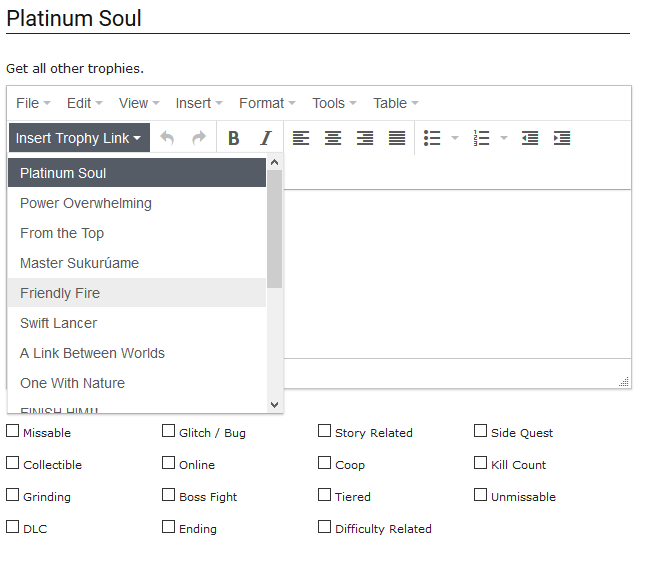 This trophy tagging can be done very easily from the trophy guide submission form. First, you will need to click the “Load Advanced Editor” button. This will load up an editor with tools that let you insert image and other fancy features. On the top of this tool you will see a box that says “Insert Trophy Link“. Click this to tag a trophy in your guide.